Some readers were perplexed to hear that I, a"master of the wired world" according to the Financial Times of London, have backslid to helping put on a not-for-profit folk music festival in my hometown of St. Paul. It was the first annual Midway Folk Festival, featuring 20 wonderful acts by local folk musicians. It's true, and it has been a culture shock for me. I am so used to pushing buttons and getting what I want right away, or a facsimile of what I want. With a folk festival, you can push buttons till the cows come home, and all you get is cows. There really is no technological shortcut to all the work of setting up a stage, alerting the media, raising funds, and herding people into ear-range of the loudspeakers. You have to actually do it. And actually doing things -- well, I'd sooner delegate. My friends, it's harder putting on a show than those Andy Hardy movies let on. A week before showtime, our funding melted away, and without the confidence of a generous friend who co-signed a loan we would not have been able to set up the stage. Some media, like the local public radio station, were happy to help us get the word out. Others sneered at the idea of a homegrown folk festival. We were perceived by certain of the hippoisie as a knot of bearded local mainstays from the 1970s. The thing we were proudest of was the thing they most derided us for -- unsellability. As a first-time event, we knew certain aspects of the show would be raggedy. The venue was a minor league baseball stadium squeezed between two rail lines. When trains rumble through on one, it's like sustained thunder. When they load on the other they're like, well, boxcars banging into each other. Then there was the weather. Reports on the weekend vacillated from clear to cloudy to look out below. Saturday turned out to be a honey of a day, and the music rang out from the stage like an affirmation. Only a few hundred ticketed patrons found us, but the show made up for it. Several performers said it was the best set they'd ever done. Ever. Sunday began as a quiet mist, but deteriorated by late afternoon into a gulleywasher.Everyone -- vendors, festival-goers, stage hands, dancers and musicians alike -- was drenched. Where have all the flowers gone? Down the storm sewer, that's where. And we who had planned the festival all year long, and poured our hopes for the year into this single uninsured, underfunded, disrespected and underattended event, looked up from our spattered plastic ponchos and gulped at the additional verdict being rendered from above. At least, that was my reaction. I felt awful for everyone, and frustrated, and tired. Had a dry towel been handy, I would have thrown it in. But something remarkable happend. 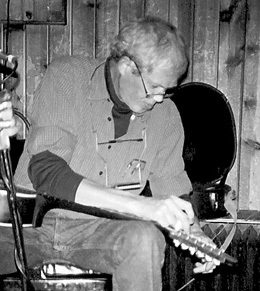 The next performer was Spider John Koerner.I had records of his going back to 1962, with Tony Glover and Dave Ray. I always liked Spider John -- so named because his legs are real skinny. But he is not to everyone's taste. He mostly sings ancient folksongs about 49ers and froggy gone a-courtin'. Even when he writes a song himself, it manages to come out pre-antiquated. And unlike most entertainers, John never sweetens a note or sustains a sentimental moment. He sings things his way, which is a punkier and less materially rewarding road than Frank Sinatra ever trod. There is not a synthetic millisecond in his entire life's work. I used to see him in saloons along Lake Street and the West Bank, this fellow who loved the songs so much he'd tend the bar all night in order to jump up on it later and perform a few. I never met the man, but he looked up from his playing once while I was buying a beer, and he winked at me. A big, broad, howdy sort of wink. You could tell it must be hell to love him. And love him you must. Because here he was, giving the music everything he had in him, and asking precious little in return. And though the rain had muddied everything and shrunk a tiny crowd in half again, Spider John Koerner was squawking away and pumping that skinny right leg, that ended in a miner's boot, up and down with an unapologetic beat. And the people who had stayed, who'd suffered through that dreadful day, were grinning. And dancing. And it took me to the brink of tears to think of the things people get through. You can hear it in the songs, the lost love and missed chances and busted deals and cosmic comeuppances, and all that secret history that's so heartbreaking and abominable. But we survive. Optimism is infectious, like that crazy pumping foot, joy outracing gloom to the punch. And this jaded technocrat vowed to do it again. One more year, folks, for SpiderJohn. Why not bookmark Mike's columns for yourweekly enjoyment?